William Victor Higgins (June 28, 1884 – August 23, 1949) was an American painter and teacher, born at Shelbyville, Indiana. He studied at the Art Institute in Chicago and at the Chicago Academy of Fine Arts. In Paris he was a pupil of Robert Henri, René Menard and Lucien Simon, and when he was in Munich he studied with Hans von Hayek. He was an associate of the National Academy of Design. 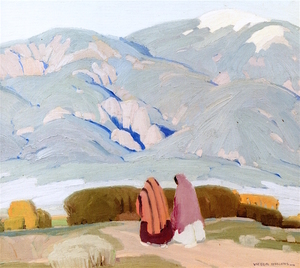 Higgins moved to Taos, New Mexico in 1913 and joined the Taos Society of Artists in 1917.